This approach of “repeal first and replace later” is, simply put, irresponsible — and could slowly bleed the healthcare system that all of us depend on. (And, though not my focus here, executive actions could have similar consequential negative effects on our health system.) If a repeal with a delay is enacted, the healthcare system will be standing on the edge of a cliff, resulting in uncertainty and, in some cases, harm beginning immediately. Insurance companies may not want to participate in the Health Insurance Marketplace in 2018 or may significantly increase prices to prepare for changes in the next year or two, partly to try to avoid the blame for any change that is unpopular. Physician practices may stop investing in new approaches to care coordination if Medicare’s Innovation Center is eliminated. Hospitals may have to cut back services and jobs in the short run in anticipation of the surge in uncompensated care that will result from rolling back the Medicaid expansion. Employers may have to reduce raises or delay hiring to plan for faster growth in healthcare costs without the current law’s cost-saving incentives. And people with preexisting conditions may fear losing lifesaving healthcare that may no longer be affordable or accessible. Furthermore, there is no guarantee of getting a second vote to avoid such a cliff, especially on something as difficult as comprehensive healthcare reform. Figure out my likely problems without wasting my time probing me to discover them. It’s not my job to tell you what to sell me. Instead, ask what’s in my strategic plan since that’s where the money will be going. Bring success stories from hospitals like mine. Tell me tactfully about the weaknesses of competitive products, but don’t slam those companies. Salespeople switch jobs often and it’s embarrassing all around when you show up with a shiny new business card of a company you were trashing six months before. Figure out who has influence in the hospital. It’s a lot easier to align with an IT director or informatics person who knows the hot buttons and can devote research time, thus earning a recommendation and faster track to the CIO’s office. Be respectfully persistent without being a pest. The squeaky wheel earns some grease, but only the point that the noise becomes so annoying that it gets replaced. I might glance at your white papers and other marketing material, but the only thing that will convince me is conversations, preferably with customers. Don’t bring a solution that doesn’t address one of my biggest problems or that won’t pay for itself. You are competing with a lot of important projects. Your star fades considerably if a capital investment is required since that’s a long-term, highly competitive budgeting process. Don’t try to sell around me. Give me the courtesy as an IT person to let me know who you’re talking to so I don’t get blindsided. You can create demand that will end up in my lap, but I still have some degree of technology veto power if you try to box me out. Don’t be in a hurry. We don’t usually slam-bam in health systems no matter how much your quarterly numbers need a boost. HIStalkapalooza 2016 was my favorite evening event HIMSS last year! Skills I can contribute to the event: willing to sample all the food at the buffet to make sure it is tasty; also will get out on the dance floor with some really mediocre moves to make everyone else feel more confident about their dancing. A frigid sales rep from ‘Sconsin, Longed for a ticket to yon sun. He daily read HIStalk, Its insight he unlocked. That his legacy nev’r be undone. I like to dance; I manage HIT interoperability partnerships with 35 partners. HIStalkapolooza is a righteous ton of fun. I read HIStalk every day and it’s an important part of why I’m effective at my job. Basically, I’m a big fan. Another haiku about HIMSS since you liked it last year: Gray suits and gray hair, Your booth’s fireplace is too much, No one wears color. To answer questions asked in the requests: (a) Party on the Moon will indeed be on stage again; (b) shoe-related activity will abound; and (c) based on response so far, it appears that, as in the last couple of years, I’ll be able to invite everyone who requests a ticket (but if I don’t, providers come first). Note: the overly large photo above serves as an eye-catcher – every year, people (usually executives or their assistants bristling with self-importance) waste my time in claiming they religiously study every single HIStalk word I write, yet somehow missed the many, many times I mentioned that signups are open and thus didn’t request the ticket they absolutely must have. I’ll just send them a screenshot of the announcements like this. The party is for readers and I feel no obligation to someone who clearly isn’t one. Your life (and certainly mine) won’t be irreparably damaged if you have to find something else to do Monday evening because you weren’t paying attention. Three-fourths of poll respondents say doctors should be held accountable for patient satisfaction results. A couple of folks question why it’s just physicians and not the front office and billing people who are on the hook, while others think it’s OK to measure and report patient satisfaction but not OK to tie the results to compensation. Others note that patients are subject to the usual maddening human variability (see: Yelp reviews) and will ding the doc because their hospital meals were under-salted or they were told to lose weight. 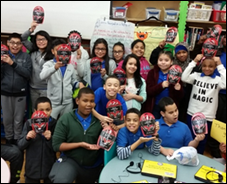 Meltoots gives examples of risking satisfaction survey retribution by doing the right thing – making patients get out of bed and refusing their demand for narcotics, no different for scoring a teacher highly because they never give homework. New poll to your right or here: When did you last earn a significant promotion or leave for a better job? Some explanation would be nice – click the Comments link after voting. Welcome to new HIStalk Gold Sponsor Sphere3, a Gartner Cool Vendor that offers the Aperum patient experience management platform. It integrates patient perception with nurse call system activity to provide insight into patient satisfaction, caregiver workload management, and patient safety. Nursing administration gains visibility into patient needs, workload, and the voice of the customer. Aperum’s Hot List identifies patients whose behaviors increase their fall risk, while the nursing department enjoys reduced call lights and response times. Clients have reported an 18 percent increase in patient experience domain scores, a 24 percent reduction in call light activity, and a 10 percent increase in HCAHPS response to call light. Check out their white paper “Reinventing Nurse Call to Enable the Real-Time Health System.” The Kansas City, KS-based company will exhibit in the Startup Area at HIMSS17, where you can meet CEO Kourtney Govro. Thanks to Sphere3 for supporting HIStalk. 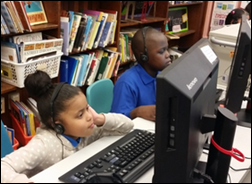 Mrs. M reports that students in her New York media classroom are using the headphones we provided in funding her DonorsChoose grant request for online learning and test-taking. I was annoyed but unsurprised this week when I needed to send my doctor an insurance form and they said it had to be faxed – they don’t have the ability to accept a scanned document attached to an email. The person’s tone suggested that they are the innovators and I’m the Luddite for not having a fax machine at my eIbow. I pictured them tending their time capsule technology dressed in No Fear shirts, singing along with Right Said Fred, and stroking their Beanie Babies. Listening: new from The Dogs, an apparently nearly unknown Norway-based punk rock band whose raw, angry sound is reminiscent of the Pixies but with more sonically rich musical hooks, a fantastically growly organ, novella-like lyrics, and a killer stage presence. 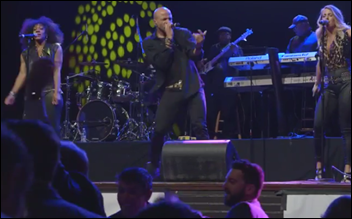 This is the antidote to lip-synching, fading divas and tedious, Auto-Tuned hip-hopper collaborations. If you don’t see puddles of sweat in front of the singer, you didn’t get your money’s worth. The Dogs earns my highest recommendation and would be amazing headlining my future low-rent version of HIStalkapalooza in a vacant lot with kegs and barbeque. I’m binge listening their whole catalog on Spotify and it’s exhilarating. Judging from their albums and concert video, this has to be one of the best bands in the world. The Advisory Board Company announces layoffs and office closures following a post-election slowing of customer activity. CTG says it will counter the slide in post-Meaningful Use EHR work by focusing on optimization and application services. A Black Book consumer survey finds a rapidly growing “digital divide” in which patients don’t trust providers to protect their data, don’t know how to use technology such as patient portals, and withhold information from their doctors due to privacy concerns. Security researchers report a spate of cases in which improperly secured MongoDB analytics databases are being hijacked by hackers who are holding the information for ransom. Senate Republications introduce an aggressive timeline for dismantling the Affordable Care Act without proposing an alternative. January 18 (Wednesday) 1:00 ET. “Modernizing Quality Improvement Through Clinical Process Measurement.” Sponsored by LogicStream Health. Presenters: Peter Chang, MD, CMIO, Tampa General Hospital; Brita Hansen, MD, CHIO, Hennepin County Medical Center. The presenters will describe how they implemented successful quality governance programs, engaged with their health system stakeholders, and delivered actionable information to clinical leadership and front-line clinicians. Q&A will follow. 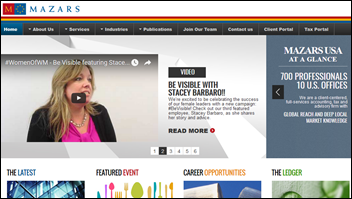 Tax, advisory, and business consulting firm WeiserMazars renames itself Mazars USA. 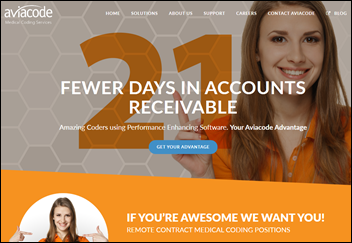 Coding and compliance services vendor Aviacode acquires facility coding outsourced services vendor Revant Solutions. 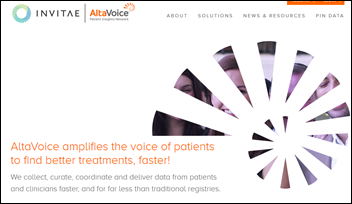 Genetic information company Invitae acquires AltaVoice, which hosts Patient Insights Networks that connect researchers with patients, for $15 million. 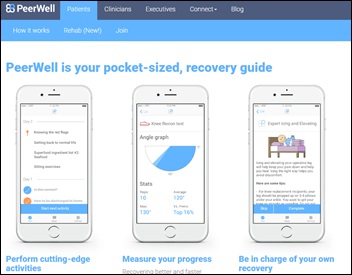 Detroit Lions defensive back Glover Quinn invests in PeerWell, whose app supports physical therapy rehab patients with exercise programs and the ability to perform their own range-of-motion measurements at home. The company has raised $2.1 million in a single November 2016 investment. Prime Healthcare chooses Phynd to gather, manage, and share data on its 75,000 providers across 43 hospitals. Myrtue Medical Center (IA) will switch from Medhost to Epic in October 2017. Heart Hospital Of Lafayette (LA) will move from Cerner to Epic in September 2017. Bibb Medical Center (AL) migrated from Prognosis to Athenahealth in August 2016 and will go live on its ambulatory EHR in 2017. Huron Consulting Group promotes John Kelly to EVP/CFO and names EVP/COO Mark Hussey as interim healthcare practice leader. Hussey replaces Gordon Mountford, who has left the company. HURN shares are down 17 percent in the past year, valuing the company at $958 million. Healthgrades hires Eric Jensen (Avia) as EVP of health systems products and strategy. ZH Healthcare (never heard of them) launches a “new unified brand” of blue EHR , unleashing a torrent of buzzwords: “enhance the power of world-leading malleable and customizable EHR … The brand stands for stability, strength and trust that clients place in our solution. The color blue speaks to infinite capabilities.” Kudos to whatever marketing firm profitably convinced the company that they ‘re adding value in cooking up this gibberish, although slipping in “malleable” was pretty cool assuming it doesn’t refer to frustrated users beating their PCs with a hammer. 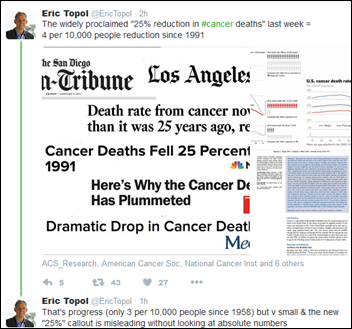 Eric Topol, MD is unhappy with the way reporters hype a tiny decline in cancer deaths over nearly 60 years in hyping a 25 percent decrease since 1991. 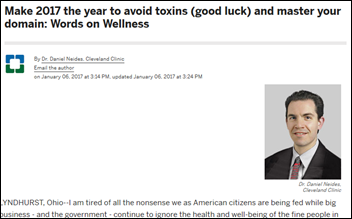 A rant by the medical director/COO of the Cleveland Clinic Wellness Institute highlights the awkward situation that can result when a traditional, respected medical institution launches a trendy alternative / integrative medicine operation whose beliefs are not only different, but sometimes scientifically sketchy. Daniel Neides, MD says he is “tired of all the nonsense” as government and businesses force us “to live in a toxic soup.” He should have stopped in that weird but safe ground, but then launched into a Jenny McCarthy-like tirade against the preservatives in vaccines, confidently opining that ADHD is a thing not because it has been defined as a disorder and parents encourage overdiagnosis, but because “something(s) are over-burdening our ability to detoxify.” He doesn’t suggest refusing vaccinations, at least, only recommending that parents talk to their doctor about timing of the injections for their children. A predictable firestorm ensued, with Cleveland Clinic issuing a terse statement that Neides won’t be doing interviews and that his opinion piece doesn’t reflect its position. 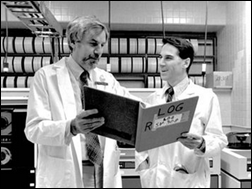 The Boston Globe profiles Warner Slack, MD, a medical school professor who developed a patient computer questionnaire in Wisconsin in the mid-1960s. One of his students was Epic CEO Judy Faulkner. The article debates whether interoperability will ever be prevalent, quoting Slack as saying he’s disappointed that EHRs aren’t providing more benefits to patients. Validic CEO Drew Schiller presents at CES 2017. This is unfair. Yes, percentages can mislead, but the ‘4’ number is per-year. And this is a big country. As one of the respondents in Topol’s feed points out, we’re talking about 2.1 million fewer deaths since 1991. Sorry for the late response but I was sick yesterday so didn’t see this until today. 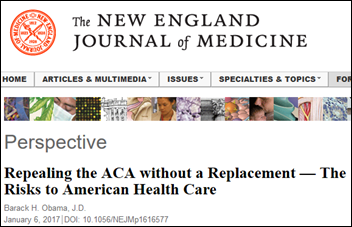 About President Obama’s comments in the NEJM; how out of touch can he be if he doesn’t understand that healthcare costs have risen significantly since his improperly named “Affordable Care Act” came into being? Which is in no way affordable, and simply forced. I have great insurance, and I am paying $700 a month for a family of 4 with $40 co-pays and ridiculous deductibles. Yet nothing close to what other are having to pay at the “exchange” rates. The ACA somehow managed to increase the deficit while sending money to EHR companies for products that cannot handle MU requirements without extreme hacks and work-arounds, and allowing insurance companies to bail from the exchange when they no longer can make extremely huge profits. I have no idea what the incoming party is planning to do. But all of the complaints that were voiced could be directly applied to the damage that ACA has caused in the past 8 years.